Conference/Training - Council of Parent Attorneys and Advocates, Inc.
COPAA Annual Conference: The Council of Parent Attorneys and Advocates (COPAA) is an independent, nonprofit membership organization of special education attorneys, special education advocates, other professionals, and parents/family members. Our primary mission is to secure high quality education services for children with disabilities. Disseminating knowledge of protections under the law, advocacy strategy, and educational best practice is an important part of leveling the playing field and enabling parents to meaningfully participate in their child’s educational programs. Each year members and prospective members gather for the COPAA Annual Conference. The Conference changes location each year, alternating in different regions of the country. 2019 is in New Orleans, LA. 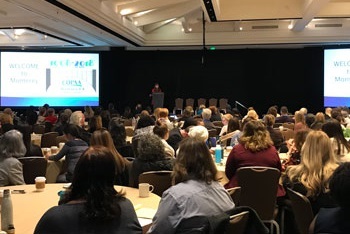 The COPAA Conference provides unique opportunities for training and networking with the most experienced and knowledgeable advocates and attorneys on special education issues. Participants attend to learn about the most recent cases, legislative changes, and the latest disability specific educational interventions. Over 600 registrants are expected to attend the conference this year. Special Education for Attorneys Online Training: This online course reviews legislated and litigated requirements for special education and related services for students who have disabilities. It is intended as an introductory course for attorneys new to the practice of special education law. Participants explore in-depth federal law and case law and the importance to secure appropriate services and supports for students with disabilities. Course includes reading and written assignments outside of the interactive live class. The Special Education Advocate Training (SEAT): There are three levels to SEAT: 1.0 for Beginners, 2.0 is a year-long course that provides participants with training to become a special education advocate; and 3.0 for advanced advocates on the business of advocacy. Webinar Training: The COPAA Training Committee is conducting COPAA webinars throughout the year. Webinars are of most interest to attorneys and advocates who represent students with disabilities, as well as parents (individuals who have a family member with a disability and do not receive any income for advocacy efforts on behalf of students with disabilities). One-Year, flat rate Subscriptions available. permitted to register and attend by COPAA. Any individual employed by or who currently receives more than 50% of his/her income from state, local, or, in the case of an attorney, who represents or has represented such an agency or school district within the past five years, shall not be permitted to register or attend a COPAA educational event unless a formal exception is granted by the Executive Director of COPAA. submits a personal statement regarding how he or she intends to utilize the COPAA training. Such application shall be submitted no later than 20 days prior to the start of the event. If the attorney billed or had his/her time billed for representation of such agency or school district during the two years immediately preceding the educational event in question, the attorney shall not be eligible for the exception. Upon receipt of the request for an exception, the Executive Director (or his/her designee) shall consult with appropriate committee chairs, as needed, and determine if additional information is needed prior to deciding the request. The Executive Director has the sole and unreviewable discretion as to whether to grant the exception. The determination of the Executive Director shall be made in the interests of the organization and members and is without recourse. If during the course of any such education event, the Executive Director determines that a non-member participant did not qualify for registration without seeking an exception but failed to seek one or that the exception granted to an individual was improvidently granted, COPAA may terminate the individual’s registration and remove such individual from the educational event, refunding only any prorated tuition fees. COPAA shall not be responsible for any other costs, expenses or claims including lodging and travel. In such circumstances all COPAA educational materials shall be returned to COPAA. COPAA educational materials may not be transmitted or duplicated to any third person or entity without the express permission of COPAA.